In 1999 efforts were being made to publish a historical book about Tallapoosa County. So, I (Ruth Lockett) began to gather data about Red Ridge Church. From this data I wrote a brief history within the publisher’s guidelines and it was included in “The Heritage of Tallapoosa County” which was published in 2000. Stories about Red Ridge date back to the Civil War and before (see marker in narthex). Early historians indicated that the first church was a log structure located west of the Dadeville-Tallassee Highway (now identified as Highway 49). The name of that church was Salem and was on a site near the cemetery located just inside the Highway 34 gate of Stillwaters. This building burned. The second structure, a wooded and weather board structure, was constructed on a site east of the Dadeville-Tallassee Highway in the early 1850’s near the present structure. This was in the Beat 9 voting precinct, which was called Red Ridge, thus the name of the community and the church. In 1892 the Agricola church was built and some people left Red Ridge and went to the new church. However, Red Ridge survived this split and remained a vital part of the community, at times few in number, but strong in faith. Red Ridge Methodist Church, in 1909, was not a part of the Conference for a short while; however, due to appeals by Rev. J. A. Smith and others, the church was accepted back into the North Alabama Conference. In its present location, the original sanctuary was partly constructed around 1925 including hand-hewn sills from the old church. Picture in your mind the plain rectangular wooden building painted white on the outside, no porch but two steps up to the two front doors opening directly into the sanctuary. Two plain windows behind the altar and along each side three plain windows. Plain wide plank homemade wooden pews, a potbelly wood burning stove in the middle of the floor, brackets for kerosene lamps along the walls and an old-time pump organ in the corner for music. In the late 1930’s and early 1940’s, Red Ridge was on a charge with Flint Hill, Poplar Springs, Agricola, and Macedonia. (I cannot locate Macedonia, but I think it was Buttston.) During this time, worship services were held once each month, sometimes on Sunday afternoon, but Sunday School was every Sunday. About this time electricity came to the area and two drop-cord lights provided an abundance of light. The church also acquired an up-right piano about this time. Agricola Church was officially disbanded about 1949-1950. When this happened the Conference gave Red Ridge anything usable from the church since it was falling down. The pews, pulpit and spindles in our altar rail came from Agricola. As you can see, many changes have taken place – electricity, carpet, pew pads, central heat and air, stained glass windows, indoor bathroom, brick work on the outside and the steeple. It was erected in 1987 and dedicated on May 17th of that year. A new sound system, additional parking, a new piano and organ have been added as well. Also, a sanctuary addition has been completed in the last few years. Worship services have changed from one Sunday per month to two Sundays to every Sunday. Since 1974 when we were paired with Camp Hill our worship service has been at 9:30 a.m. and it was between 1983-1985 when weekly worship services began. Membership has fluctuated through the years from 70+ in 1937, down to 35-40 in the 1950’s and 1960’s, with attendance at about 12-15 per Sunday. Currently membership is about 239 and attendance is approximately 135 each Sunday. I was writing this history October 13, 2002 after the Board meeting at which we approved a budget for 2003 of over $100,000.00. In my folder of research data on Red Ridge United Methodist Church I found a copy of the 1952-1953 budget (50 years old). The total was $691.80. Yes, $691.80 for the entire year. Times have changed. Thanks to all of those who have worked so hard through the years to keep Red Ridge United Methodist Church a vital part of this area. Since it’s inception, Red Ridge has continued to grow, motivated by service to God and the community. The congregation was acutely aware that if the growth was to continue, the attendant facilities had to grow as well. The period 2000 to 2002 saw several projects come to fruition. The sanctuary was enlarged to include new windows and additional seating. A much-needed addition to the fellowship hall was completed including a new kitchen. A new basement under the fellowship hall was added containing two classrooms, restrooms, and additional storage space. The final project of the period was the Red Ridge Memorial garden, located in a wooded area just to the east of the church. In 2011, there was an increasing concern that if the church didn’t continue to grow, it would wither. Research supported those concerns. Couples and families were turning away because they couldn’t find seats together. There were also some infrastructure issues contributing to the problem like poor restrooms and inadequate heat and air conditioning on the main floor, but the primary indicator was something called the 80% rule. If a church continues to operate at or above 80% capacity, it will kill any potential for growth. And if a church doesn’t grow, it will wither away. Red Ridge had been operating at or above 80% capacity for nearly 3 years. Something had to be done. In October of 2012, after a lot of hard work and preparation by Pastor David Carboni and Building Committee Chair Chip Johnson, the congregation decided to renovate the church and build a new sanctuary. Having gone to the Lord in prayer, the congregation fervently believed the project to be God’s will. The project was titled, “Building in Faith”. Construction began early in 2013. As the project progressed, the congregation moved into the fellowship hall for Sunday worship services. Finally, on the 16th of March, 2014 Bishop Debra Wallace-Padgett made it official when she consecrated our sanctuary. The “Building in Faith Program” was now “Built in Faith”. Just because the facility was compromised during the building program, didn’t mean services to church members and the community were diminished. Red Ridge continued it’s missions, ministries, and community service without a break in continuity. It was and continues to be a testament to the lay leadership of the church. In the time since the “Building in Faith” project, Red Ridge has actively pursued its mission of making a difference in the lives of members and those in the community. 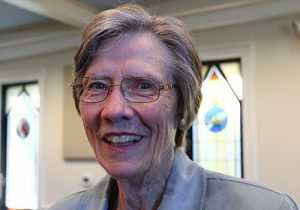 The church continues to keep itself in the public eye through its community ministries and special events. The Red Ridge Choir has been and continues to be crucial to the success of this effort. 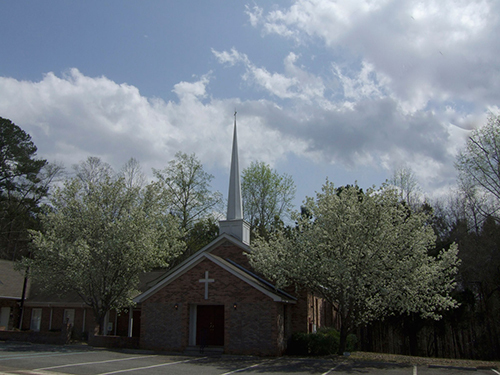 Red Ridge United Methodist Church has been a successful, small country church circa 1828. It has survived fire, building renovations, split charges, ever-changing leadership, unpredictable economies, and world wars to remain a strong, vibrant church with a loving congregation and all without losing its country charm. 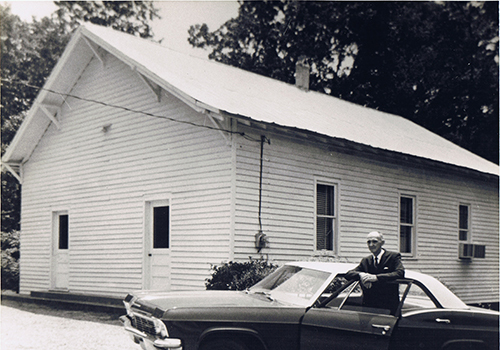 The church has grown in membership and the attendant facilities over the years. The congregation not only “talks the talk”, they “walk the walk”. In all probability, there is not another church in our area that is as active in the local community as Red Ridge. They don’t wait to be told, they take the initiative when they see a need. Outstanding, responsible, leadership is the trademark of these missions and community activities, and all are headed by creative personnel who are proactive in their approach to community service to the glory of God. With a 1995 survey of the cemetery serving as a major source document, in 2011 Bert French took the lead on having the Red Ridge Cemetery designated as an Alabama Historic Cemetery. The application to the Alabama Historical Commission contains a number of fascinating details. Among the veterans buried here are ten who fought for the CSA and we recently learned that our founding pastor was a veteran of the war of 1812. There is a marked grave for an ex-slave and then there are the “unique cast iron grave markers“. The application lists 250 marked graves (some multiple) and notes that there are numerous unmarked burials. A web search has shown that there has been a considerable amount of time and effort spent by approximately 30 individuals from around the country to document the Red Ridge United Methodist Church Cemetery. At present, findagrave.com (a free site) contains approximately 270 entries for us. A typical entry contains a picture of the grave and information taken from the marker. Often there is linkage for memorials to relatives and additional information concerning the life of the person. Current efforts are underway to work with members of our community and with those folks from around the country who have information on the cemetery to expand and update those records. Check out the site and see if you have any information to add or corrections to make. The Alabama Historical Commission has requested we provide them with any new information we develop.